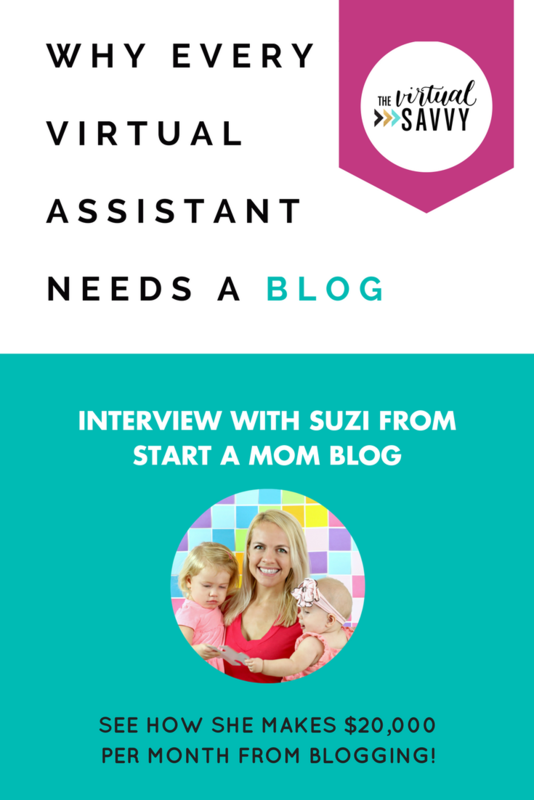 Does a virtual assistant need a blog? I had no idea at the time that blogging would become such a HUGE part of my life and business. When it comes to the topic of growing a profitable blog, my FIRST reference is my good friend Suzi from Start a Mom Blog. She started her blog completely from scratch (WHILE at home with her kids) and grew it to a $20,000 per month income. I asked her to join me for an interview and to guest post here on The Virtual Savvy blog, and I was so happy she agreed. You are going to LOVE this. I guarantee it. Why Every Virtual Assistant Needs a Blog. The world we live in today is amazing. While you’re building your VA skills in a particular field, you can also be building a business. While you learn, you can earn! 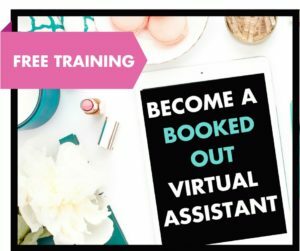 In other words, while you’re a virtual assistant, you can be charging for your services, learn more skills, charge more, and actually start teaching those skills on your own blog, too! Hello, second income stream!! Being a virtual assistant opens up a world of possibilities to you! You can work with top entrepreneurs and earn while you do it. As you grow your virtual assistance business, I highly recommend establishing your own blog and creating a second, somewhat-passive income stream. Showcase your work as VA. Generate affiliate income through products and tools you recommend. Help you teach others and make passive income through online ebooks or courses. If you’re a new Virtual Assistant, a blog can help you by acting as your online resume. So if you’re still a newbie virtual assistant, your blog can be a way to get more clients. It’s a place that can showcase your amazing work, testimonials from past clients, and integrate a contact form. 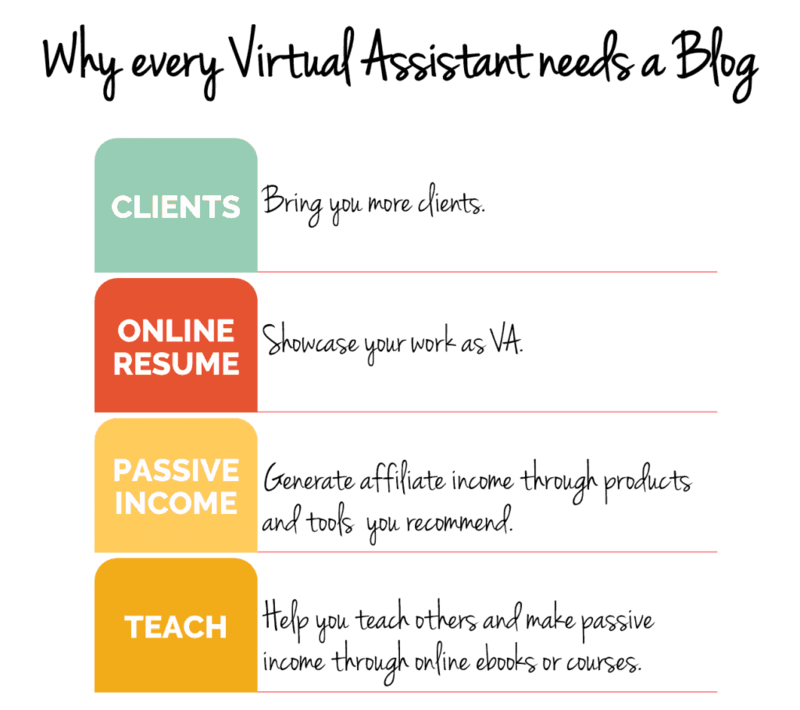 You know all those skills you’ve learned as a virtual assistant? Teach them! Create mini-courses, focused ebooks, or blog posts, and help others. You can share your blog posts on social media to get traffic back to your own site. You know that amazing work you’re doing for your clients — why not do it for yourself too? Build content, grow an email list and establish other income streams so you can design the life you want to live. On my blog, I teach moms how to start a mom blog – I offer free guides, templates, and courses. It’s a very niched and focused site. Your blog can either be highly focused on the amazing skills you have as a virtual assistant and make money through ebooks and courses, or it could serve as a broader topic blog where you can let your creativity run wild and make money through ads and affiliate marketing. What is a Blog and How do I Start One? Your blog is your home on the internet. It is where you have written blog posts, videos, products, and images. It is fully under your control unlike a social media page on Facebook or Pinterest. You control the content and customization on your blog. 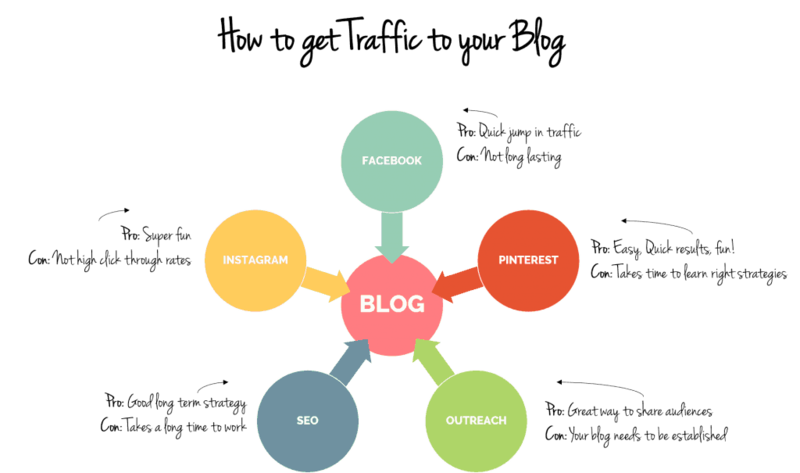 Your blog can serve as a traffic source to your products and services. And it can make money passively through affiliate marketing and advertisements. But first, How DO Blogs Make Money? Ads are easy to apply with no requirements. Some larger companies do require a minimum number of page views. Google Adsense – no minimum page view requirement, a good place to start! Affiliate marketing is when you market someone else’s product, and you get a commission when a reader makes a purchase through your affiliate link. It’s a win-win for you and the affiliate company. Most beginning bloggers sign up for the Amazon affiliate program because it’s free to join and you can recommend thousands of products that fit your niche perfectly. Amazon.com – Millions of products – and most beginning bloggers start here! 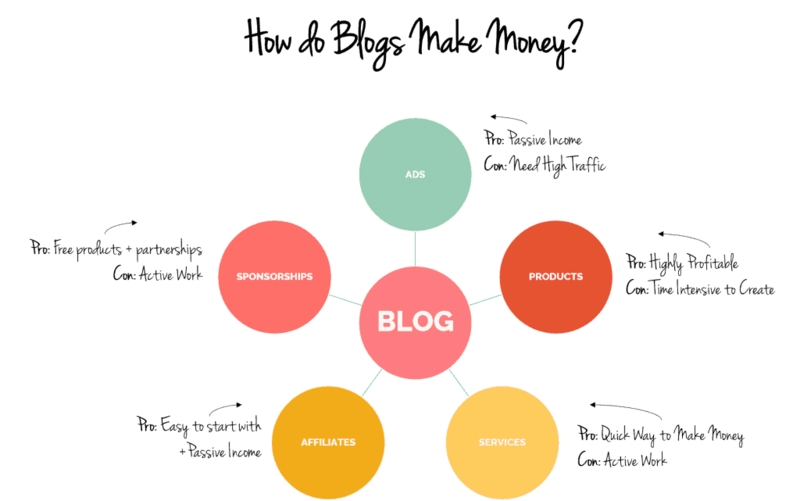 This is a blog post that you write for your sponsor and publish on your own blog. Your sponsor pays you to share it with your readers on your blog. This is definitely one of my favorite methods of making money with a blog. Providing your readers with something you created provides real value to them. If you’ve learned the shortcut from point A to point B that solves a real problem, people will line up to buy it from you! For example, my free mini course on how to use PicMonkey generates over $1,000/month through affiliate sales! Of course, you’re familiar with this method. You can offer your services: email management, stock photography, marketing, printable or content creation, etc., and make money that way. If you’re offering services, your blog serves as your online resume and client magnet. It’s also super marketable. You can write blog posts showcasing your skills and share them on social media to get more clients. How do Blogs get Traffic and Page Views? There are countless ways you can generate traffic to your blog. You can work on SEO (search engine optimization), social media (Facebook, Pinterest, Youtube, Instagram) or outreach. The easiest way for most beginning bloggers to get traffic quickly to their blogs are either through Facebook groups or Pinterest. Facebook traffic is great, but it’s a quick hit. Pinterest traffic tends to stay a little longer and grow as your blog grows. I share my exact strategy that I use, my semi-looping Tailwind and Pinterest strategy, that has grown my blog from zero page views to over 70,000 page views per month! As a blogger with a wonderful virtual assistant, it took me a few years before I realized I needed the help. I wish I took the plunge earlier. I asked my virtual assistant what questions she personally had regarding blogging so I can answer them for you below. What do bloggers want help with most when it comes to their blog? In the beginning, most bloggers need help with creating content and getting more traffic. As they grow, their need shifts to customer service and email management. What’s an easy way to understand analytics when you’re not tech-minded? Learn as much as you can. If you invest in yourself, you can share that on your blog (online resume) or with your existing client and become even more valuable. Invest in courses on Google Analytics, Tailwind, and other online services. You can also grow a huge knowledge base just off of free videos on YouTube. Never stop learning. Are you comfortable outsourcing copywriting for blog posts as well as emails? This depends on the blogger. Some may be ready to outsource this personal part of the business immediately, others may need to read your written voice first before outsourcing content creation. What skills do bloggers look for in a virtual assistant? I look for someone who is quick to respond to emails and messages, who adapts to my voice easily, who thinks of little things I may be overlooking, and who completes the assigned tasks promptly. Trust is also a huge factor. That was the #1 reason why it took me so long to get my own virtual assistant. It was a big trust thing to allow someone else into my inbox. But after I heard great reviews and testimonials from other bloggers, I was ready to hire her. Should your blog name be geared toward your services, your name, and/or your interests? As an established blogger, what gives me the most trust in a virtual assistant is seeing a focused blog. If you blog about parenthood, fashion, food and a bit of virtual assistant on the side – I might be turned off as a future client. But if I visit your blog and it’s focused on your skills and services, that fills me with confidence. The content of your blog is more important than the name. You could use your own name – that gives you the flexibility to change directions. You could mention your services – “The Email Management VA” – which gives you more credibility on that skill. You could be a bit more vague – “Productivity Booster” – this allows you to both showcase your virtual assistant skills and teach on the topic too. If in doubt, use your name. It’s always great to have your own name domain name. As soon as I got serious about blogging, I went and bought suziwhitford.com – it doesn’t have much on it right now – but at least it’s mine. What are the First Steps to Starting a Blog? If you want to grow a passive income stream as your building your virtual assistance business, blogging is the perfect solution! I have a free course that walks in detail through what to blog about and how to monetize it. 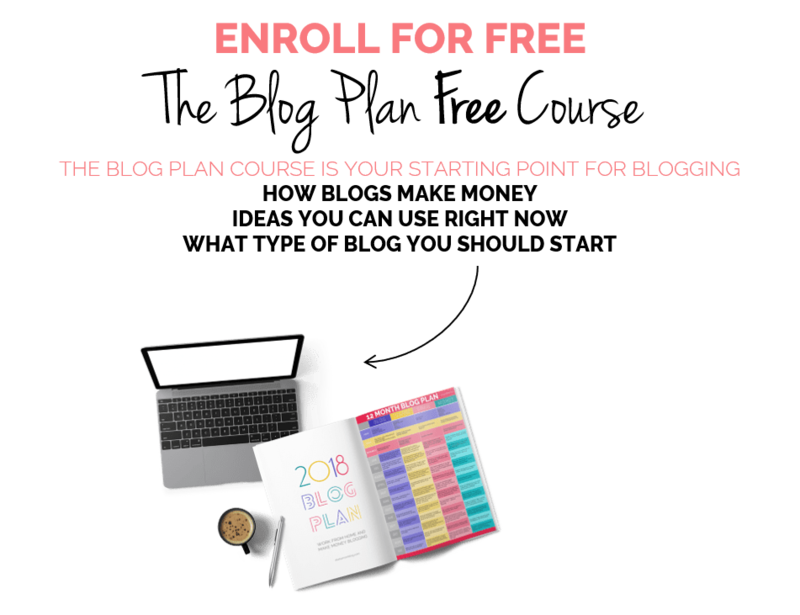 It’s called The Blog Plan, and it’s designed to help you plan your future blog! You can enroll in the course for free here. You’re on the path to grow a wonderful business for yourself. Continue to invest in yourself as a virtual assistant and your path to success will be quick. Do you have a blog? Let us know in the comments! Hi Tarah, thanks for stopping by the blog! And how exciting to start blogging (and Suzi is amazing, isn’t she!?). It will get you on the right path–i.e., sign on paying clients asap. Let me know if you have any questions, and good luck! Just like Tarah, I too am excited to be on this journey and psyched to have found both you and Suzi! There does seem to be a problem with the link to the webinar. Could you perhaps let us have the correct one? I just wanted to pop in and say, Thank you so much for your blog posts! Abbey…you’ve been a great help and resource. I’ve learned so much the last couple of weeks from you, researching and reading/listening to your blogs, videos, Facebook page etc. I really appreciate what you do in giving much needed info on VA’s! I can’t wait to dive into the VA Boot-camp…soonest. Really looking forward to it. Suzi, you are just great! I’ve purchased your Blog by Number e-book. As soon as I can, I’ll invest in your Blog by Number video step-by-step resource. So far, I’ve really enjoyed and learned so much about blogging from your YouTube videos etc. Both of you add so much to what I need to start-up my own VA business. I’m actually trying to convince my sister to join me – she’s had 25+ years corporate experience. I’ve had 15+ years corporate experience. She still works half-day as she is a single mother with a special needs child. I home-school my two children and living in a country where it’s not easy finding employment…VA is the way to go! So this is just a shout-out to you both…Thank you for offering these services and most importantly sharing your experience and knowledge and lots of freebies…which really helps, with the world. Thank you *so much* for the incredibly sweet comment Ashleigh! I’m so glad that you’ve found both my resources and Suzi’s (she’s AMAZING, isn’t she!?) helpful! Once again, very informative yet so inspirational. I’m glued to your blog and learning so much. How do you do both. I started a lifestyle blog 9 mos ago tailored to moms and womanhood, plus I have a separate wig making biz. I’m a certified teacher who LOVES teaching and consulting. I’ve created various courses and checklists but have a hard time growing a large following so if I launch something I get 1-2 sales where I can’t live off of. I want to add VA services cause I have the skills and need money now like yesterday. MLM isn’t working for me (that’s another story) I know I cannot add another site to my list of what I already do. I would seriously crash, so thinking of intertwining the VA services into my lifestyle blog, but Abbey how on earth do you do both (manage blog and VA clients) when starting out? I have 2 young very busy boys. 1 is 4 and the other is 10 months. Hubby works 12-20 hour shifts (I know beyond crazy). Sorry for such a long post. I’m very eager and determined. Hey Yondel! You’re definitely not alone with the craziness of life & managing a business (or businesses!). What I suggest is to focus solely on the VA business for the time being (most likely a few months), as that will bring you an immediate source of income. Once you’re in the swing of things with your new clients, then you can start working on your blog again, without the added financial stress. In terms of managing it all–it comes down to amazing time management skills! I’m a huge fan of time blocking–sit down with your husband and your calendar (Google calendar is great! ), and figure out the times in the week that you’re going to work on your VA business (and/or your blog). Can you find hour+ a day to work *just* in your schedule as it is? Perhaps early in the morning when the kids are still sleeping, or in the evening when the hubby is home (and not working a super long shift)? If not, can you rearrange things to make that happen? And last but not least, as soon as you can, outsource! That may mean hiring someone to help with your own businesses, but it also may mean hiring someone to help with other parts of life too: cleaning, cooking, childcare, etc. Good thing I have stumbled on this blog to learn more. I am myself is an aspiring virtual assistant. I got a year of experience under my pocket and I’m hoping to start my own too! Sadly, I got on and off on my experience as a VA for what reason, I don’t know, maybe I got little skills under my hands to keep the ball rolling. But this post, it helped me to gain new ideas to incorporate within my skills. I’m looking forward to build my own website as a VA now. Thank you for this. Hope to read more of this stuff in the near future! So glad you’re liking the blog Julius! Welcome to the community! Is it reliable to hire a virtual assistant for business services? Absolutely!!! With any job that you put out there, whether it is employee or contract, there is always a period of accepting offers and vetting the applicants. Often times, when working with VAs, we call it a discovery call to see if the VA and potential client are good fits for each other. This will let you see and hear the person and you can discuss if the VA has the skills you are needing for your business. You are welcome to submit your position to http://www.thevirtualsavvy.com/hire. Fill out that form and we post it in the community of VAs that I have trained through my VA Bootcamp course. Wonderful post with visual explanation. Thanks you so much for these helpful Article! So glad you enjoyed! Wishing you lots of success!